Lot Detail - Annie Abbott. Casino de Paris. L’Inexplicable Mystere. 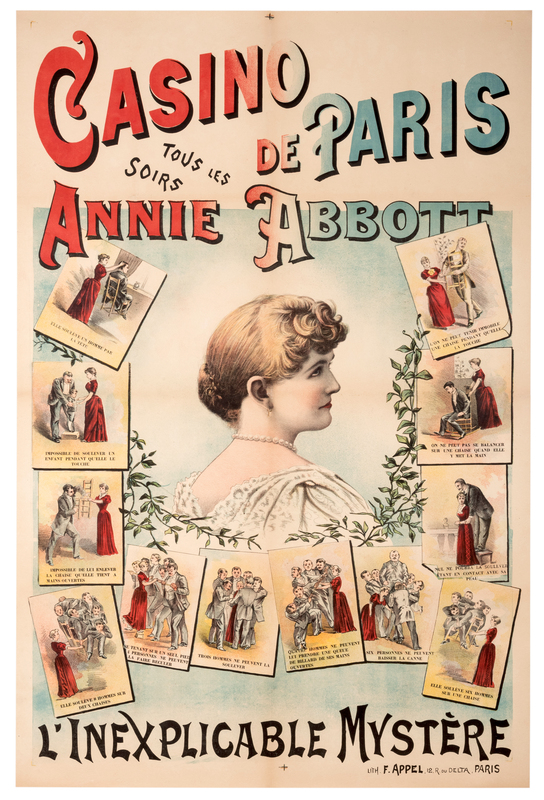 Annie Abbott. Casino de Paris. L’Inexplicable Mystere. Abbott, Annie May. 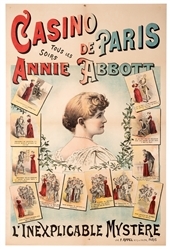 Annie Abbott. Casino de Paris. L’Inexplicable Mystere. Paris: F. Appel, 12 R. du Delta, ca. 1900. Color lithograph bearing a portrait of “The Little Georgia Magnet” alongside vignettes depicting her feats of strength. Linen backed. 58 ½ x 38 ¾”. Scattered minor over-coloring along old folds. A-.